The first legend is present in the Catalan culture. Once upon a time, in Cappadocia, a dragon was terrorizing the population. To satisfy its hunger, villagers began the dragon two lambs a day. Unfortunately, one day, there were no more lambs around. The kingdom decided to choose two people at random, through a lottery system, to be sacrificed to the dragon. The first to be nominated was none other than their very own princess. Luckily for her, Sant Jordi came to the rescue. 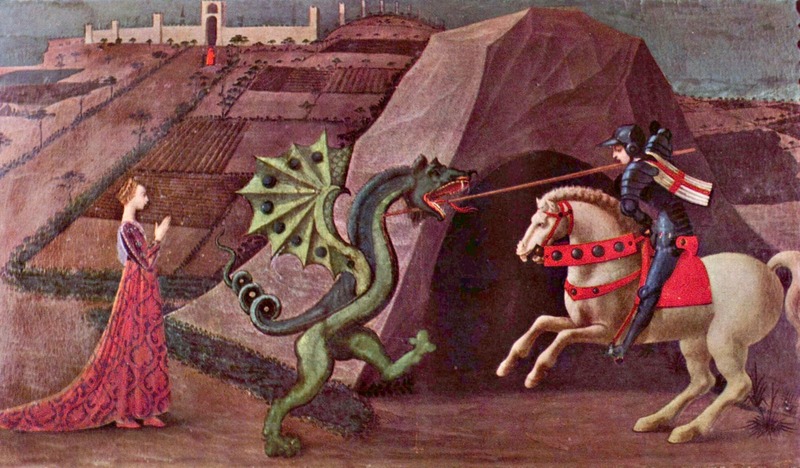 He killed the dragon with his lance (spear-like weapon) and from the dragon’s pouring blood, a rose grew. Fact: this day is still celebrated in Catalonia, the 23rd of April. It is considered as the Valentine’s day of Barceloa, where men give roses to women and the women a book to men. The second legend is coming from a prologue of Joseph Martinez’ book, Drakcelona, the City of Dragons. In this one, dragons from all over the world had to meet one day in Barcelona. The night was cold and wet when they arrived. As agreed before, each one of them took their place in the city to wait for the next step. They waited and they waited again, so long, that some of them forgot why they were there, others fell asleep and others went on to explore the city. They finally decided to stay in the city that was so welcoming to them. Drakcelona was born. 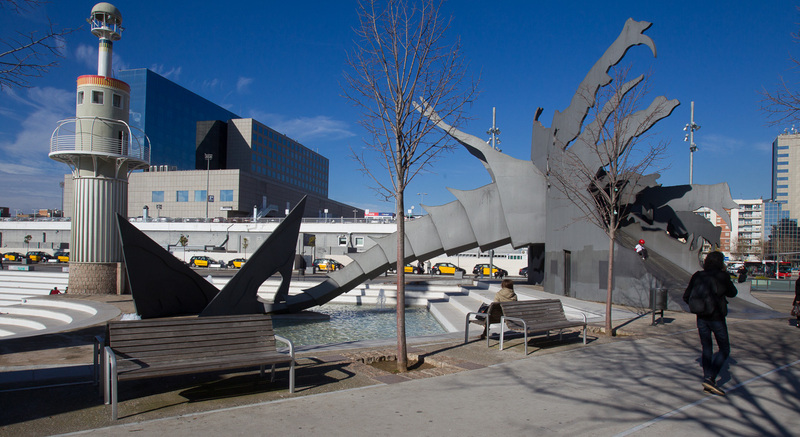 You will find the biggest dragon of the city at the Parc de l’Espanya Industrial. Created by Andrés Nagel, a Basque sculptor, this giant is 12 meters high, 32 meters wide and weighs 150 tons. Added two years after the opening of the parc (1987), you will find slides have been built into the sculpture for the children. While in the park, it is a nice place to picnic, go for a small boating tour on the lake or enjoy a bit of soccer with the family. 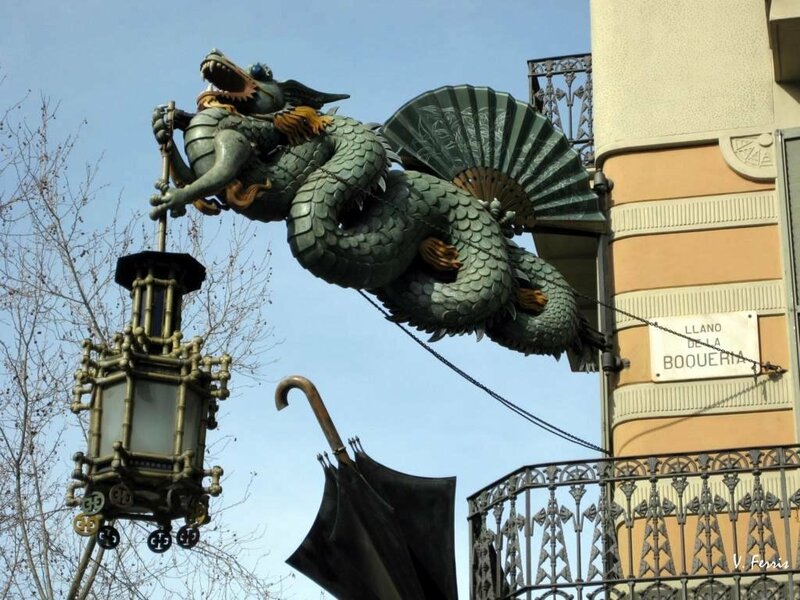 The most exotic dragon is located at Casa Bruno Cuadros, on La Rambla. Known as the Casa dels Paraigües (House of the Umbrellas), this building used to be an umbrella shop. In 1883, the architect Josep Vilaseca took care of the refurbishment of this casa. Barcelona was booming, so was the modernist movement. The architect combined this movement with inspirations from different cultures, which created an atypical house. The smallest dragon is on Plaza Reial, more precisely on the floor lamps. Indeed, these lamps were the first work Gaudi was commissioned to do for the city. Each of them has a dragon on top and a plaque with the architect’s name. This square is one of the most famous of the city, you will find here different restaurants and bars. It was built in 1848, by Francesc Daniel Molina I Casamajó, on the remains of a Capuchin monastery. The modernist one is another work from Gaudi. 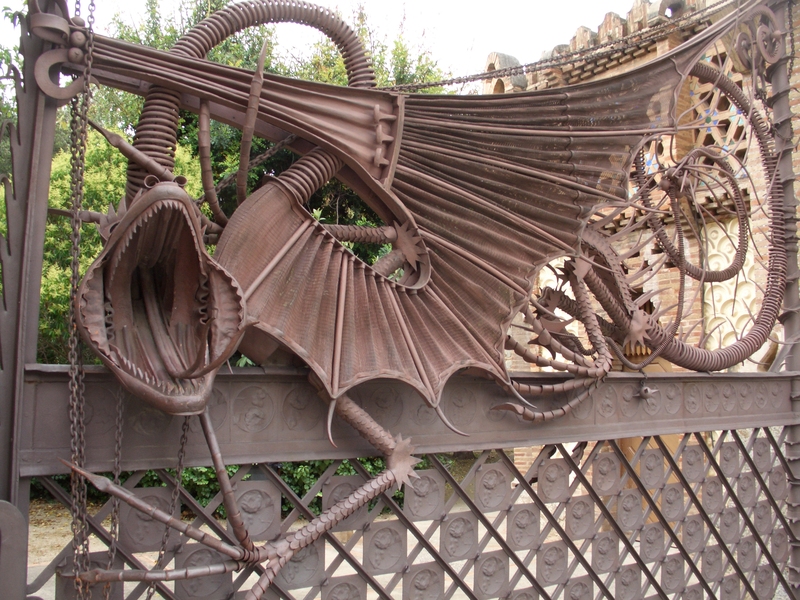 Located on the gate of the Pavellons de la Finca Güell, this dragon protects the former Güell family’s house. It represents the mythical dragon from the Garden of Hesperides, a guardian of this garden which contained golden apples with immortal power. 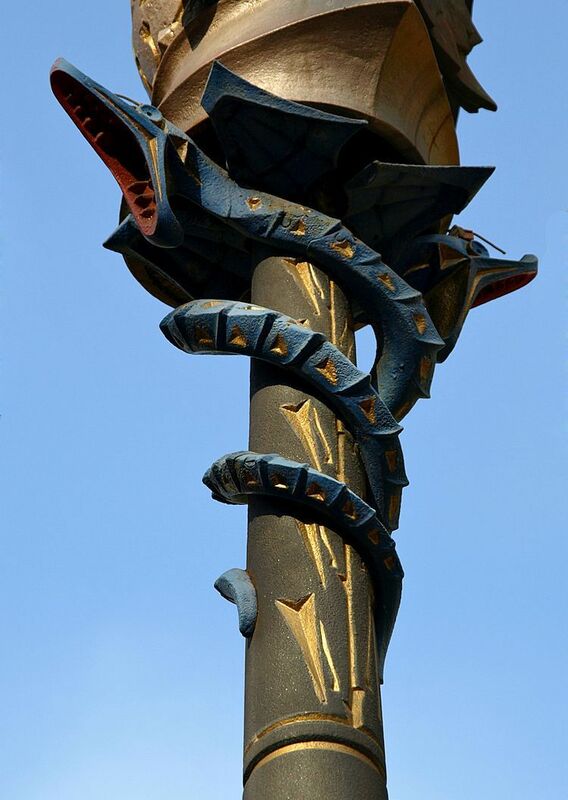 The most famous, obviously, El Drac, at Park Güell, is a symbol of the city and Gaudi’s work. This piece is now located in a part of the park with entrance fees, the monuments are a must-see. You can also enjoy a walk in the rest of the park, with a panoramic view of the city at the top. 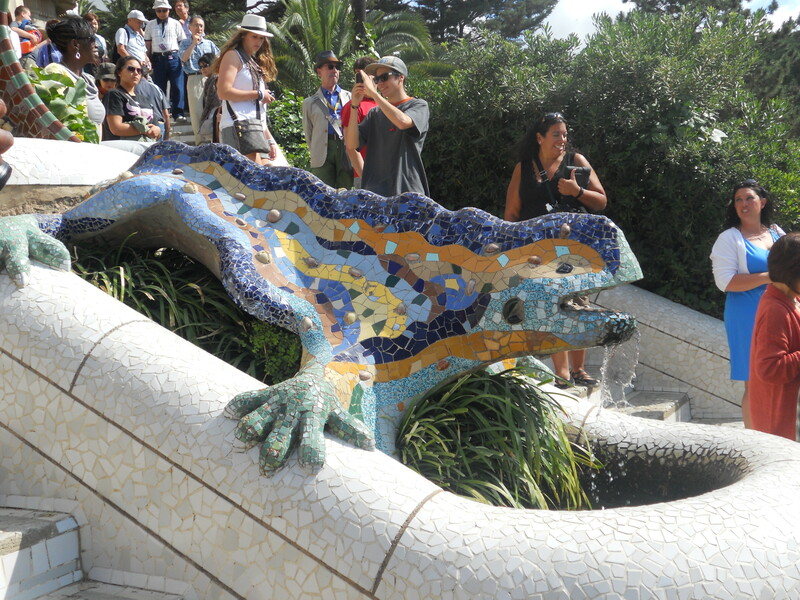 For a dragon guided tour of the city, you can also see Kids & Cat, with the Barcelona, City of Dragons tour or Maica Chacopino, for a Drakcelona visit. Book your stay in our family hotels in Barcelona!